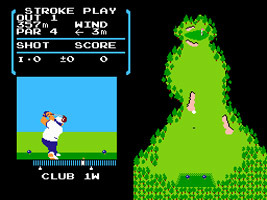 A NES game of golf. Choose your clubs and swing to hit the ball across the green and into the hole within a certain number of strokes. Different clubs are used for different drives. You swing by stopping the meter to determine your power and accuracy. Be wary of the wind, as well as course obstacles such as sand bunkers and the water. When you reach the green (the area surrounding the hole) the screen changes to putting mode, where you have to tap the ball towards the hole, taking the lay of the land into account.